Doug Wimbish is having an amazing career. 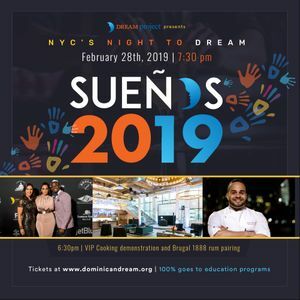 DREAM’S 7TH ANNUAL NYC BENEFIT WILL TAKE PLACE AT THE MEZZANINE AT 55 BROADWAY, NYC, WITH AN EXCLUSIVE VIP TASTING WITH CHEF KELVIN FROM 6:30PM TO 7:30PM. AT 7:30PM OUR MAIN EVENT WILL BEGIN, HEADLINED BY OUR AWARDS AND THE DREAM BACHATA ACADEMY BAND. The WimBash All-Star Band - Brandon "Taz" Niederauer, Raghav Mehrotra & Doug Wimbish are proud to be a part of this special event! Confirmed guests include some of New York’s most prominent philanthropists, educators and celebrities. All proceeds from the event will go towards DREAM’s early childhood development, at-risk youth and workforce development programs.